There are two worlds in Yellowstone during May. Some people choose to miss out on the best. In the north, it’s dry, dusty and tick friendly (it turns out I’m not fond of all wildlife). Counter intuitively, in the south it’s still a winter wonderland with snow-closed roads. These worlds can be less then a kilometre apart when the elevation changes quickly. And so it came to be that we stopped on the road with Yellowstone Lake covered with ice to our left and a snow-covered field to our right. The view to the left was simply beautiful. I would have spent considerable time admiring it, however there was a better offering on the right. As we drove up, we saw an animal walking slowly on the snow. I couldn’t believe my good fortune when I realized it was a gorgeous fox. 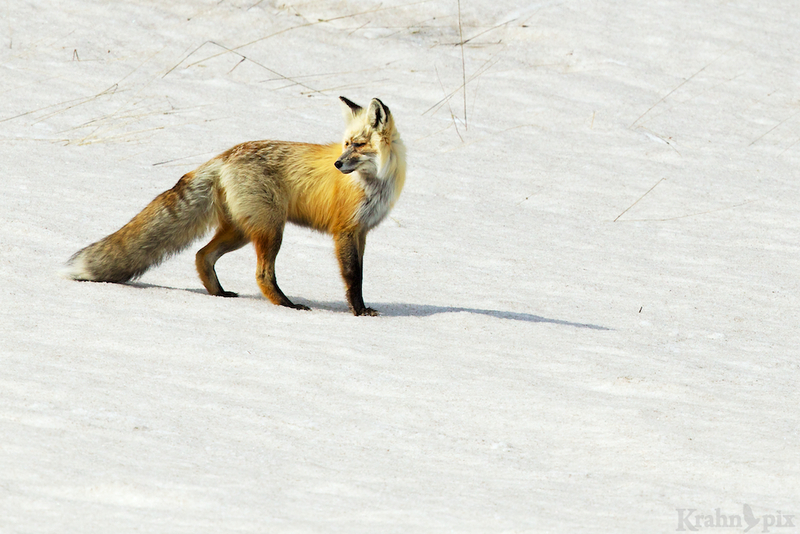 Before Yellowstone, a fox was on my most-wanted list. I had seen only snatches of a fox’s bushy tail with no photos to prove it. Now I had an unobstructed view of this nimble predator, wandering back and forth over a large open space, hunting and giving us an inside view of its remarkable behaviour. It was hard to breathe and photograph – I was so excited! Time seemed to stand still. Later we determined that we had spent about an hour watching and admiring. I would be surprised to ever replicate that incredible experience. While this scene was playing out like an wildlife documentary, a vehicle pulls up just down the road from us and a number of people jump out. They immediately begin photographing each other in front of the lake – a behaviour best left to psychologists to properly explain. Classic tourist photography was being committed in full view of the fox – only they chose to turn their backs to a scene of a lifetime. I can only conclude they were just visiting from another world. That is one gorgeous tail! I found some satisfaction that even the fox broke through the snow occasionally. On the move – the search for food never seems to end. Carefully listening for any movement under the snow. Digging into the fridge looking for a snack. Chewing on a delectable morsel. Beautiful fox and some great captures Lyle. Makes me want to get on a plane right now! I wish I could tell you the exact spot so the same fox would be there but it never seems to work that way. The experience made all that driving worthwhile. I appreciate the comments. No it doesn’t does it? Some really great posts coming through at the moment. You’re obviously in the groove! Looking forward to the next ones! Great commentary and super images! Thanks so much. I think it was the most exhilarating time I’ve had watching wildlife. It helps to get inspired. I appreciate all the comments. It was a remarkable coat on an amazing creature. It is hard to describe how much fun it was to watch. That IS a beautiful tail! Did the other tourists even notice him I wonder? It sure was easy on the eye! The other tourists weren’t there for long, I guess they didn’t find much! Thanks. Elegant is a great word to describe foxes. I am fascinated by them so it all added up to many magical moments. The carload of tourists were a ways off and didn’t stay long so they created more bemusement than anything. Wow, one of my *favorite* creatures… Just look how amazingly lovely she is. How lucky to witness!! Such wonderful shots. Thank you. Yes that’s one of my favourite creatures too. And I completely understand how luck I was to see it all unfold. Wow Lyle, all the images are brilliant and the beauty in the landscape is breathe taking.The fox is certainly different from what we have here, the tail is so bushy and beautiful. Another set of magic images that deserve to be put into a magazine or something. Your writing ability compliment your images perfectly. Have you thought of publishing your work?? Thanks so much. I’m still surprised at that wonderful tail. It really has a fantastic opportunity with a such a remarkable creature. For now I’ll stick to blogging. The competition is pretty fierce in the publishing world. I think you are doubting your ability, remember “you’ll never know if you don’t give it a go!! If you are staying blogging ill continue to enjoy your work. That little fellow sure does have an exceptionally gorgeous tail. What a great story your pictures tell – right up to the success at the end! Thanks. I really couldn’t get over the tail. It is disproportionally large for the body but I could see when it jumped that the tail was useful for balance. Congratulations on your fox. He is a magnificent creature. Thank you. It is magnificent and pretty talented in the hunting department though I expect that’s a requirement for survival. Beautiful, beautiful photos! Your story, although sort of funny, mostly leaves me in awe, and missing being out in wilder country. It must be strange having a group of tourists show up at a moment like that. Thanks. Glad you liked it. I can assure you it was a strange moment when the tourists showed up. It was like something didn’t belong in this picture! It was! Thanks for the comment. patience obviously pays off Lyle. Great series of shots!! Thanks. Patience does pay off though I’m often wanting to collect sooner. It was a fun time. Thanks. That coat is pretty amazing and the colours so rich. Dear Lyle , Only one word SPECTACULAR ! Great photography.Best wishes, Ganesh. Thanks. It was so much fun to be there and then be able to share the photos later. Stunning, Lyle! Great captures and I am sure it was simply magical, watching this gorgeous creature. Thanks. Magical is the right word. Rather than just quickly take photos, I was able to watch it hunt and learn some of its behaviours. This series of shots is simply amazing, Lyle. Getting a photograph or two of such a beautiful fox would have been quite an accomplishment, but you managed to capture so many different poses of the fox, including the incredible one of it diving into the snow. Thanks so much. Spending an hour with it got me a lot of photos and great memories. In this case, snow seemed to be the perfect backdrop. Very nice pictures, I love photographing foxes so am very jealous of you! Thank you. It was my first time and a real thrill. Beautiful pictures, Lyle. Optimal light, fox – and the happening itself. Lucky you! You are absolutely right. I was very fortunate in so many ways including the light. Great series of shots Lyle! I couldn’t help notice that its left eye is partially to completely closed in all the photos. Looks like an old injury but with a pair of good ears and one eye I’m sure it’s not slowing the fox down much at all. Thanks. I had noticed that one eye was more closed in a photo or two but not in all of them. That is interesting. In the hunting that I watched, your assessment seemed right – it caught and ate quite a bit. Very cool that you got to see him digging into the fridge. It was very cool. It seemed to like the snacks quite a lot too! Oh WOW! What a gorgeous post Lyle. I love the shot with his face in the fridge! Thanks. Glad you liked the post and the fridge shot. That was a lot of fun to watch. I have saved some better shots for a future post. Great pictures! I have seen a few foxes in the wild over the years, but they usually don’t hang around for a photo shoot. Thanks. Not hanging around has also been my experience in the few times I have seen them in the past. I did have to go a long way. And you have a fox family right where you live. I’m jealous! That’s quite the welcoming committee. They are amazingly cute. Yes that’s a problem that’s not going away any time soon as the areas that are truly wild become less all over the world. Wow – That is am amazing set! You are so right about the two faces of the northern parks right now – it’a wonderful time to experience them. I see foxes in the woods here but have never captured them – these images are wonderful. Thanks. It was a unique experience with the fox at least for me. I never got tired of turning that one corner, down the road from Mammoth, and suddenly it was winter. The foxes I see are so much smaller than that – that thing is just stunning. May is a wonderful time in the parks at that latitude. I remember having a snowball fight with my parents at Crater Lake in June. I thot it was a larger one but then wondered if I was just biased. Altitude makes such a difference. It’s funny how snow in summer can be such a fun discovery. They are truly beautiful creatures. A friend once wrote a poem about this snow hunting behavior after observing a fox in a snowy meadow in Yosemite Valley in February. Thank you for the gorgeous photos to illustrate the poem! Thanks for the comments. I’d be interested in reading the poem. Thanks. I sure learned to like it even more after watching it and that surprised me. Thanks. I had a lot of fun watching. I have yet to figure out why the tourists don’t save themselves a bunch of trouble and just pose in front of a poster. That’s hilarious and so true!! I love the mixed colors of the fox, and the motion of its fur blowing in the wind. Beautiful! Thanks. I love those distinct colours too. It’s a beautiful animal. Wonderful wonderful pictures!!! That is a VERY bushy tail. Oh what a beauty! Thank you.